The Competition opens on October 1st 2018 and the closing date for entries is 15th November 2018. You must be a UK citizen. You must be 16 or under on the 3rd February 2019 (the date of the Competition finals). You and your parent / guardian must agree to abide by the rules of the Competition. Make sure you and your parent/guardian read and understand all rules of the competition. Print off the entry form and complete all details, including your parents’ name at the bottom of the form. Scan and mail the completed form to mike@mikedolbear.com. Post your 2 minute performance on Facebook or YouTube and fill in the URL details on your entry form. PLEASE MAKE SURE THE URL WORKS! Please use the hashtag #youngdrummeroftheyear19 on YouTube or Facebook. Please note there is no entry by post this year. After the closing date for entries, a shortlist of 40 will be published on this website . Following that, the names of the 10 people who have made it through to take part in the live Competition finals will be published. Those 10 will also be contacted by phone and email. 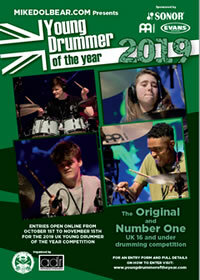 The Young Drummer of the Year finals will take place in London (Rickmansworth) on Sunday 3rd February 2019. Details of the venue, times and booking procedures will be posted on this website once they have been finalised.